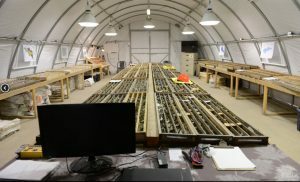 YUKON – Toronto-based Nickel Creek Platinum (formerly Wellgreen Platinum) is moving into phase 2 of its metallurgical testing program on samples from the Nickel Shaw nickel-platinum group metals project 317 km northwest of Whitehorse. The second phase involves the use of a mini-pilot plant belonging to XPS Expert Process Solutions, the company conducting the tests. The results will be incorporated into a new mine plan and economic model in the upcoming preliminary economic assessment of the project. Nickel Creek is following up on its 2017 exploration program by conducting a geophysics program this year to test several targets. The Nickel Shaw project area has a strike length of 2.2 km along an 18 km trend. The goal is to identify additional mineralization beyond the known resource. As of June 2017, the Nickel Shaw property contained measured and indicated resources of 362.0 million tonnes grading 0.25% nickel, 0.13% copper, 0.015% cobalt, 0.231 g/t platinum, 0.244 g/t palladium, and 0.040 g/t gold. More details are posted at www.NickelCreekPlatinum.com.